In 2004, my family stepped off a plane after one year of serving on foreign missions to Central Asia. We had taken our six-month old newborn, Jeremy, to a third world country few had ever heard of, until we explained, “It’s a country next to Afghanistan.” Then, “Ohhhhh…” followed by lots of wide eyes and impressed nodding. Deep down, it had been a pretty impressive step of faith, I thought. My husband then committed to full-time ministry, as we delivered a glorious testimony to the faithfulness of God. Surely, I anticipated, God must have even greater blessings in store for us. He sure did; just not the way I’d thought. A handful of months later, after having him evaluated for a speech delay, our son had been diagnosed with autism, followed by subsequent diagnoses of ADHD/Anxiety NOS and mental retardation. In a nanosecond, my ebullient testimony evaporated. All the spiritual credentials I thought I’d banked up were now gone. I crumpled up my so-called spiritual resume and chucked it, thoroughly disgusted. Now, I was nothing but pissed. After twenty years of ministry, every weekend and family vacation revolving around the church calendar; my entire married life, I’d driven to church in the same car with my husband, the worship leader, perhaps five times. After all this, the title of church staff felt like a cruel irony as I struggled bitterly in my heart, yet dutifully put on my “Praise the Lord!” mask at church. But the dissonance was growing louder, and driving me mad. Like Jacob, everything I thought I’d accumulated was now gone. Now, I suddenly had a handicapped child and a freshly crippled faith. Both demanded healing — or at least some intensive, crisis intervention. Left with nothing but bitterness and indignant questions, it also drove me to wrestle with God like never before. God’s response to my tantrum was to remind me who I was, a sinner. Like Jacob, I was a deceiver who lived for appearances; accumulating reputation credits as a “Super Christian,” a deacon, the worship leader’s wife, even as a missionary. Such duplicitous motives stunk far more rank than all of Jacob’s livestock. But all those trappings were now gone, “across the stream,” and I found myself up a proverbial creek without a paddle. I was wrecked, left alone to wrestle with who I was without them, and who God truly was in my life. But He also reminded me that while I was yet a sinner, He loved me — fists raised to the skies and all. A loving Parent is gracious and magnanimous enough to endure a spoiled child’s fit of temper. He was a God big enough to look beyond my faults and see my need. It took several years (my stubbornness was not easily overpowered), but my pride was ultimately wrenched by the grace of God. But rather than getting my stuff restored, my soul was. I was then given a new identity and purpose: To truly know and pursue Him, not His stuff. Autism has been my personal Peniel, through which He has immeasurably blessed me. 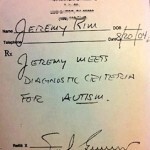 Jeremy still has autism (and God only knows what else), but the blessings have been in the brokenness… and surrender. I used to think my son’s disability, his “brokenness,” was intolerable. But now I find myself glorying in my own. May I forever limp in humility and submission before my God. For when I am weak, He is strong. Have you been wrecked? What issues are you wrestling with God about? What might He be trying to accomplish –in you— through those struggles? What blessings or insights about yourself and/or God have you gleaned through life’s hardships? Special Needs parents, how has your faith, character, identity or purpose been challenged or transformed through your child? How I’ve struggled with this in the past. As we worked through the diagnosis of all three boys and my husband with a rare disorder, then autism and epilepsy, among a million other diagnoses (it seemed!) – I was sure God had abandoned us along the way. The fact is, I feel God has used our journey and my children in fundamental ways to help bring joy, comfort and even (maybe?) inspiration to others. My friend showed me a mature faith that I would strive to grow into as we continued on our own journey. Through the years I have learned that the comfort He gives me is just an amazing indication of the comfort I can *hopefully* give to others. But I’ve also seen that His will for our lives is abundantly more than I could ever hope to understand. His will is seen in every smile, every triumph and even in every trial we go through with our boys. And it’s an amazing thing. Oh, WOW Katrina! It’s like we’ve been living parallel universes. But never met until now 😮 AMEN to everything you shared. Just amazing! I too, walked with dear friends who lost their child. Their faith continues to inspire, humble and challenge me in the same way you’ve experienced. I’m THRILLED to find you and I share the same heart to comfort others (SN Parents) with the comfort we’ve received from Christ. Man, I knew we were on to something as we started messaging back and forth. But this… 😀 I’ve been nodding vigorously to every. single. sentence. of your comment. I can’t believe we just “met” via Twitter today?! The WWW can be an amazing thing, in the hands of our amazing God. Eager to connect with you again soon…. !